Looking for a candy alternative this Easter? 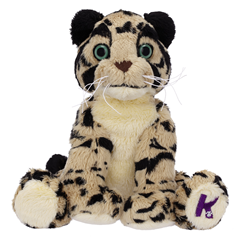 Consider Kinectimals and Kinectimals Plush Pals! Our family has given basket after basket of sugar highs and crashes to our children for Easter over the years. This year, Microsoft asked us to try an Xbox game, Kinectimals, instead of candy. 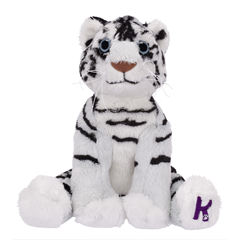 Make a friend for life with the world’s most adorable cubs – Bengal Tiger, Lion, Panther, Cheetah and Leopard. Take a wonderful journey of discovery using your voice and body to interact naturally with your cub. Share exciting adventures and fun challenges as your teach your new best friend tricks and build a bond that grows every time you play. The game started with a cute story that we sat back and watched. I immediately noticed the vibrant colors and details in the animation. We were drawn in and excited to see what was going to happen. After the initial story, we were brought to a field with several cubs and asked to choose one. After picking one, we were introduced and allowed to interact with it before “adopting” it as our friend for the game. 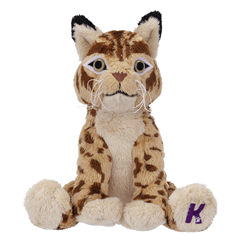 Just like real pets, your “Kinectimals” will come running when they hear your voice, respond to commands such as “jump,” “roll over” and “play dead,” and purr with joy when you scratch them behind their ears. We took video of our interactions with the game. There are some adorable moments… take a look! My overall impressions: I played the game with both Emma (age 4 1/2) and Ethan (age 2 1/2). Ethan needed constant guidance, but thoroughly enjoyed his interactions with the cubs. You can hear him yelling Tiger’s name in the video and he enjoyed helping train the cub to do tricks. The free play section was best for him, as he could not grasp the concept of following a storyline. Things like decorating his house and reading the pirate map were over his head. This is definitely not a game he could play by himself, but it is a game he can grow into. Although he doesn’t quite understand exactly what he is supposed to be doing… he grinned from ear to ear and had a great time. Emma was able to follow the story line a little more, but she is at the age that she doesn’t want help… “I can do it!”. After playing the game about 30 minutes with me she began to show frustration. She was irritated with the “guide” Bumble as he would pop on the screen when she was trying to interact with the cub. She would ignore him and try to continue, but he was just trying to give her tips for the game. I am going to attribute the frustration and irritation to being tired, though, as she has played again and was able to play along without getting aggravated. Emma also has the tendency to get too close to the television and the Kinect cannot “find” her. When reminded to step back, she does and the Kinect “finds” her again… then life is good. I loved the challenges (games) and interaction with the cubs. You can watch as I had a petting session in the video above. You also need to feed and give your cub drinks. Everything you need is in the toy box… toys, brushes, food, water, treats etc. 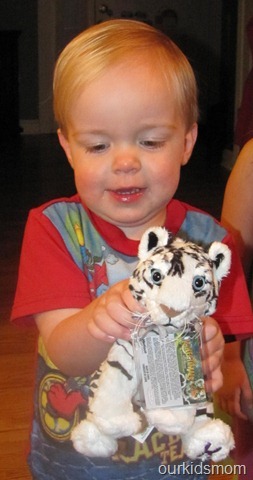 There are a few games (there are 30 total) where the cub gets dirty and you can use a brush to clean him. To be honest, I am not really a video game person… so storylines and having an agenda aren’t my cup of tea. I still loved this game, though. 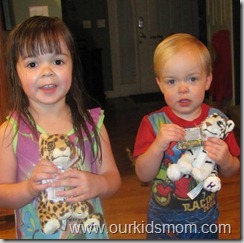 I was able to interact with my two youngest children and share my cub. We played the game, giggled, smiled, interacted with the cubs and overall had a great time. I know that there are many more adventures left for us to unlock and experience… there is treasure to find, more challenges to beat, more of the island to explore, tricks to learn, some shopping to do and more. 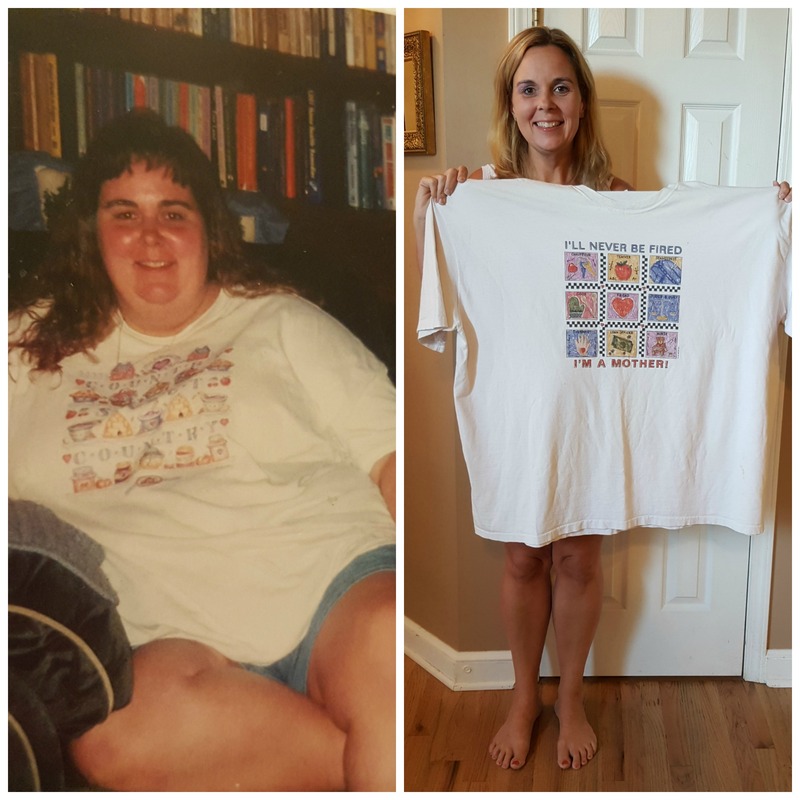 I love how we weren’t stagnant… you have to get up and move. I would guesstimate that a child around the age of 8 and up could play this alone and “get it”. Younger children still really enjoy the interaction though! Kinect is a fantastic concept and I can’t wait to get more games (the Kinect Adventures that comes with it… O.M.G. FUN!). 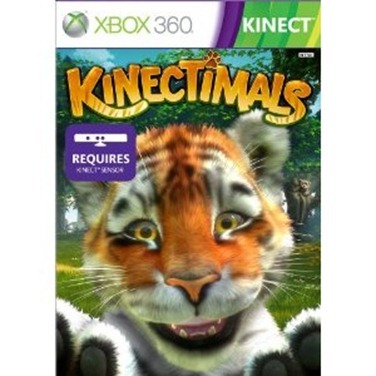 Kinectimals is rated E for Everyone, is designed for the Xbox 360 and requires a Kinect Sensor. You can purchase Kinectimals for $25.67 at Amazon.com (RV $49.99). Now you can play with your cubs anytime you want! Kinectimals Plush Pals come with a special bar code on their tag. Head over to the scan stone in the meadow at Fur Town… scan the tag and your cub is now in the game! Emma & Ethan love to snuggle on their cubs and get excited when they see them animated and “alive” in the Kinectimals game. Our pals got a little smooshed in their shipping box, but with time they are fluffing back out and are almost as cute as their animated counterpart in the game. 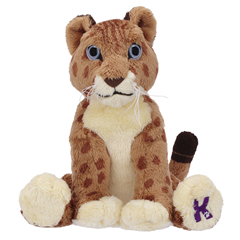 Kinectimals plush pals can be purchased at Toys “R” Us and Target for $11.99. 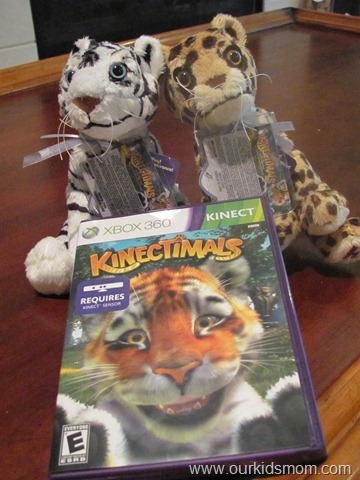 if you buy “Kinectimals” at participating retailers, you will be able to get a plush pal toy for free. Check your local retailers for details. Disclaimer: We received samples to facilitate this review. All opinions are 100% my own. 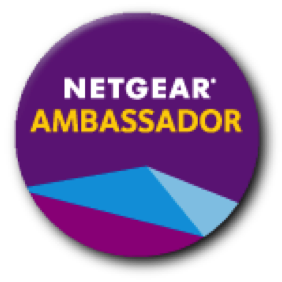 Your experience with the product may differ from mine. We love our Kinect! Kinectimals & Dance Central were immediate buys (they were the reasons we wanted the kinect!). Now I need the plushes! SOOOOOO cute!! My son would adore this game! He loves animals, we have this game on our must have list! Thanks so much for sharing your review, it let me know we really do HAVE to have this game!!! How cool! I think my kids would love this! Definitely will check it out! This looks like a great game for young children (and even my teenager) and the pets are great too! These guys are adorable! I am a softy for stuffed animals anyway, but these are just too cute! We love our Kinectimals game & I am so gonna have to get the matching plush. Adorable. That looks like so much fun and I love the fact it comes with a plush toy! This looks like so much fun, and I love that it comes with plush! My kids would LOVE this. wow, that looks really cool! 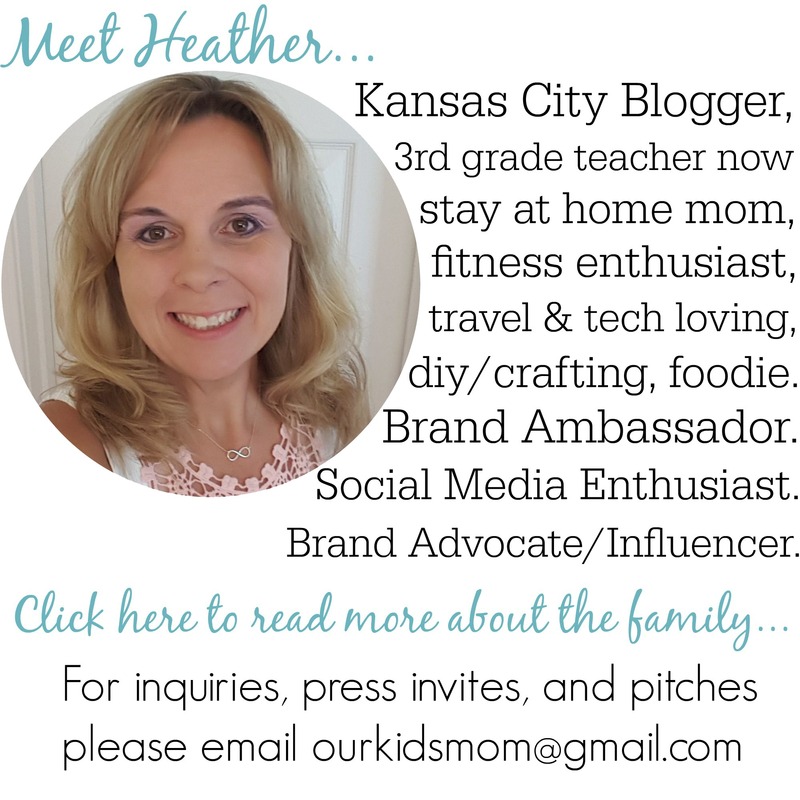 my son is almost 5 and would be all over that! the video was great, I totally ‘get’ what it’s all about now! This is awesome! Any kid would love it. Thanks for the wonderful review. My younger ones would like this. Heck, the big kids are really just big kids. We haven’t gotten an xbox, we may in the future.